This bridal shower invitation features a bold and flashy “Here Comes the Bride” with your shower details beneath. Here are the fonts that have been used in the design above. Like this bridal shower invitation? You can personalize it with your own wording and details at minted. 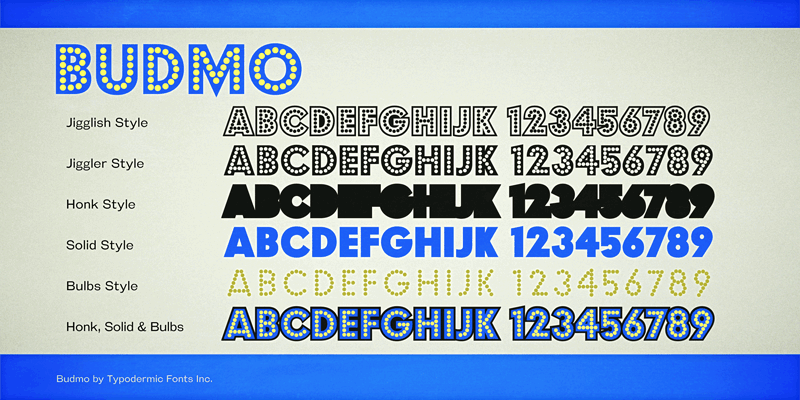 Budmo is a dotted decorative typeface designed by Canadian type designer Ray Larabie and the font family is available in five variants. You can use the Jiggler or Jigglish styles on their own or try layering the Bulbs, Honk and Solid styles. Jiggler and Jigglish are free for download. You can download them here at Myfonts.